Matthew and Samantha Monk were expecting their first child. But 17 weeks into Samantha’s pregnancy, a sonogram showed the baby’s diaphragm had not formed properly. His liver, stomach and bowels were developing in his chest, leaving little room for the lungs to grow. On October 11, 2017, at 39 weeks pregnant, Samantha, a Pediatric Intermediate Unit nurse at OSF HealthCare Children’s Hospital of Illinois, gave birth to their son, Harlan, at OSF HealthCare Saint Francis Medical Center. Though the couple were thrilled to meet their son, they knew this was just the beginning of a long road ahead for him. At only 5 days old, Harlan underwent surgery to correct his condition, called a congenital diaphragmatic hernia or CDH, performed by Dr. Charles Aprahamian, a pediatric surgeon at OSF Children’s Hospital. After a successful surgery, Harlan was doing well, but soon he took a turn for the worse. His lungs weren’t providing enough oxygen to his body. He was put on life support, which helped give his lungs the break they needed. One week later, his lungs were functioning better on their own. Harlan spent the next three months in the Neonatal Intensive Care Unit (NICU) where his journey with OSF Rehabilitation began. From the moment Harlan was born, his care team focused on the CDH. He wasn’t able to feed like typical newborns for the first few weeks of his life. So Harlan began feeding therapy right away. 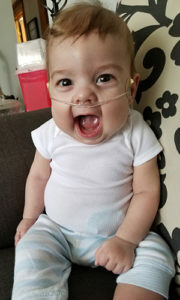 Harlan was released from the NICU at 3 months old only to be readmitted to the hospital two days later because he wasn’t able to keep food down. He spent the next two weeks in the Pediatric Intermediate Unit (PIC) at OSF Children’s Hospital. While in the PIC, Harlan was evaluated for physical and occupational therapy, helping the Monks understand what milestones Harlan should be hitting. Two weeks after being in the PIC, Harlan was released to go home, where he was able to stay. That’s when he began outpatient rehabilitation services, including physical, occupational and continued feeding therapy at OSF Children’s Hospital clinic at Five Points in Washington. 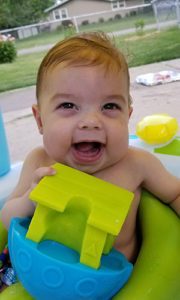 Today, Harlan is a joyful, healthy, 8-month-old. He goes to therapy every two weeks where he has been recently working on fine motor skills, sitting up and trying solid foods.